Yards of 100% linen in spring fresh colours or muted fall earth tones, stretched on my print table, is a palette beckoning pattern. If I were to paint a picture few people would see it, but designed into a piece of wearable art, it travels with you exhibited on your body. The process I love, I guess, is to cut the design of the garment, combine colour, texture, drape, and then print and or paint the linen surface with traditional motifs inspired by Kilims or the cascading nasturtiums and lilacs in my garden. 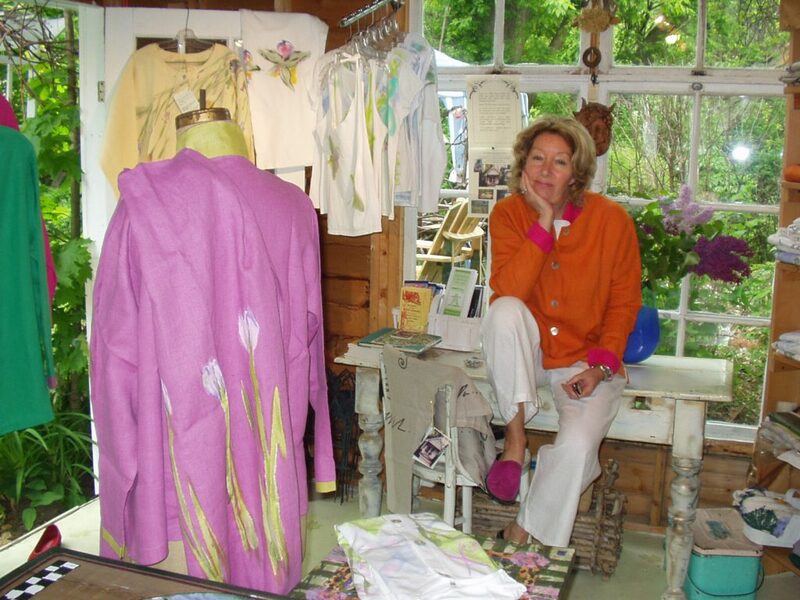 My old river home and studio, on the north shore of the St. Lawrence River, is an inspirational landscape for the style of clothing I design — elegant yet casual. All garments are 100% linen or cotton and are individually silkscreened and or hand painted with environmentally friendly, water based pigment. All garments are “One of a Kind” and washable. My recycled painted furniture is created from salvaged architectural findings, old wallpaper, buttons and knick-knacks. My floor cloths –“art you can walk on” — are designed using a similar motif that I use in my clothing, but adapted to a more painterly style, to fill a larger background. They are finished with a clear acrylic glaze so they can be wiped, making them decorative yet functional. After graduating from the Ontario College of Art and Design with scholarship funding, I drove overland to India in the early 1970’s. On this trip I began to photo document traditional textile techniques of India and Asia, creating not only a life long love for Asian textiles, but also a body of reference material for my teaching in fabric and textile departments at colleges in Canada and the U.S.A. I continue to travel and work in these countries, and years later, after witnessing first hand the erosion of traditional craft through tourism, I returned to a post graduate programme in ecotourism to work in conserving and protecting indigenous culture and art. My work as an artist /educator now takes me to shows in Canada and the U.S.A. as well as teaching textile workshops at various colleges and Universities.